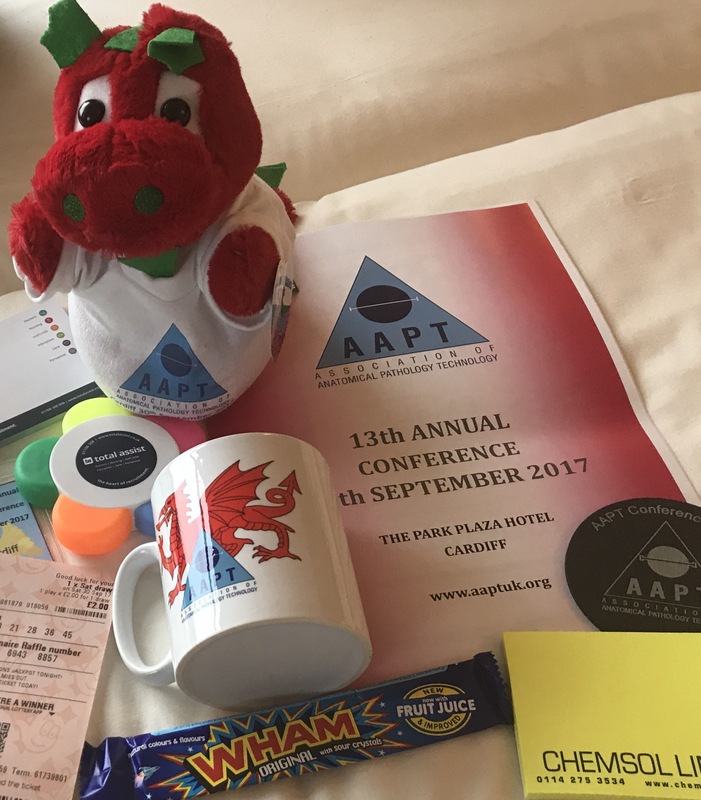 Last weekend, the Association of Anatomical Pathologist Technologists (AAPT) held their annual conference in the Park Plaza hotel in Cardiff. This cheeky, yet-to-be at that point, Mortuary Assistant writing this very blog managed to get a ticket all thanks to my new boss who was eager for me to go. It did make for many an interesting conversation when various people asked me how long I had worked in the business and I gave a little smirk and said ‘I start on Monday’ to be returned with a startled look and an ‘Oh!’. I actually happened to have looked at the schedule well before I even thought I might be going, when I saw that it was happening through the AAPT website. As mentioned previously, two of the talks in particular stood out to me as being interesting but I can’t deny that they all held a certain amount of interest for me. I thought I would do a quick summary of the day and my experiences for anyone who is interested and would like to know more. The day kicked off early at around 8.30am when I arrived at the hotel with my new colleagues and we had a little wander around the stands and stalls of the various businesses attending the conference. This was great for two reasons, it was a good way to get chatting with people and introduce myself, while also conveniently being handed free stuff like there was no tomorrow. Who doesn’t like free stuff in all seriousness, even if I am aware this makes me sound rather shallow. The best item I was handed, however, is the first one which is a little squidgy dragon in an AAPT t-shirt that I have named Llewelyn. The talks throughout the day were in pairs with coffee breaks and a lunch splitting them up. Each break was an oppurtunity to meet more people and have a chat. I’ll admit I’m not great at networking, and I also seem to have a forgettable face which does not help in these situations. I should explain, through my entire adult life I have always struggled with meeting people through anxiety but also because people seem to meet me then immediately forget my face. I perhaps should have gone to work for MI5 for this fact alone, however it makes it very hard situations when you smile at someone you have met before and they look at you blankly. Must work on being more memorable! The first two talks of the day were on CQC Inspection Preparation and TB & the Mortuary. The CQC are the Care Quality Commission and they inspect mortuaries to ensure that they are compliant with the different regulations and quality standards required of them. Without going into too much detail, this talk was very interesting to me who had very little previous knowledge of what this entailed. The speaker went through the various aspects of inspection and what was focused on in different areas, in what felt like a reassuring manner. The TB talk was fascinating because even though I thought I had a fairly good knowledge of what tuberculousis is, it turns out I did not. I never knew that there were so many different forms of tuberculosis and, in general, the BCG vaccine a lot of people used to be given is not 100% effective and does not prevent everyone from getting it. I like that the speaker of this talk spoke about TB like it is a sentient being, that it lives inside people to survive and does what it can in order to do so. The third talk was on a favourite topic my past readers will recognise, Organ Donation. This was led by a Specialist Nurse who is part of the Organ Donation team in Wales looking after those who donate and their families. This talk was so interesting because she went into a lot of detail around the process of donation and speaking to the families about this process. She also covered the fact that Wales have the opt-out scheme I spoke of recently and how this works. I really felt like I wish I had seen this talk before I wrote my blog post on this, but it’s given me a lot of food for thought for an Organ Donation II article and what else to include in that discussion. Fourth in the line up was a talk I had been particularly looking forward to, Corpses and Cat Videos, focusing on how the mortuary can use social media to it’s own benefit. The speaker talked through these benefits and discussed things like Twitter takovers and Facebook groups which I know and love so much. I think this talk more confirmed my beliefs around how I could use social media going forward rather than actually teach me anything new, but it was great to listen to this from someone else’s perspective and discuss with other guests after. I even connected with the speaker on Twitter the next day which solidified that I was doing the right thing so far! After a hearty lunch, we started back with a talk around electrical implant devices, e.g pacemakers, their history, uses and how to recognise them. This is something I was thinking about writing about in future because they are so fascinating, and dangerous. I always thought that an ICD (Implantable Cardioverter Defibrillator), if cut through by a scalpel, could electrocute and possibly kill the person on the other end. The Cardiac doctor who led this talk seemed to think it would hurt and be harmful but not enought to kill which was very interesting. The other danger of these devices is that if not removed from a person prior to cremation they can explode due to the nature of the batteries reacting to being heated. This can cause serious damage and I would like to look more into occurrences of this for some reason! The last main talk was by a guest speaker from Holland who went through CBRNe in the mortuary. This refers to Chemical, Biological, Radiological, Nuclear and Explosive situations with which you can be presented with in a mortuary situation. He discusses a few examples he had encountered himself, and it was fascinating to listen to him go through how each time the mortuary had to rethink it’s own procedures and what it needed to do for the best outcomes. Following the afternoon break, there were two abstract talks which were of around ten minutes each. The first was discussing Thanatophoric Dysplasia, and the speaker spoke so fast I think this could have been utterly fascinating had I been able to keep up! I think maybe this just goes down to my lack of experience and knowledge but I will be giving this topic a google to try to understand it better. Lastly, another talk that I was certainly looking forward to, was regarding Mental Wellbeing in the APT. This talk was really well presented, and I thought hugely significant to bring to light an aspect that many may not have previously thought of in this field, as with many other professions. However, this should particuarly be in the forefront of the mortuary workers minds considering the stressful and often graphic nature of the work. I hope this talk made others think about this subject and consider it’s importance. The day ended and everyone looked forward greatly to the evening meal and event. I was eagerly awaiting this too, until we arrived at the venue and I realised that I was sat on a table with several other people I had never met or had any idea who they were! Those I had heard of had either spoke earlier that day or were significant figures in the AAPT. My anxiety levels went through the roof and I grabbed myself a gin and tonic and took my seat while trying to calm myself down. Luckily my new boss text me to ask how dinner was so I explained, he asked who I was sat with and then reassured me that they were all lovely and I would be fine. A friendly lady who organised the conference came over and said something very similar too. I was actually offered to sit in a vacant seat at a table where my colleagues were sat, but I declined as I knew I needed to meet other people and just bite the bullet. I’m glad I did because everyone on my table was friendly, chatty and I had some great conversations. The evening was splendid and another day ended with a big smile. Cardiff treated us well, and although we didn’t explore too much, we did encounter a punch up happening in the road about half way between the conference hotel and ours, and it also provided us with a McDonald’s breakfast the next day before I drove us home. I had a fabulous time and loved every second, I felt so chuffed to be a part of something like this and hope I get to go to many more in the future (I have been told that next year’s conference just so happens to handily be in London). I would like to say a big thanks to the speakers, the organisers and the other attendees for making my conference experience a great and enjoyable weekend. To those and everyone else please like, comment, subscribe and ask questions galore if you have any, as always.